Fitness pioneer Jack LaLanne turns 95 on September 26. To people who grew up in the 60's and 70's, LaLanne is one of - if not the - most instantly recognizable fitness names: someone who has been relevant, vocal and visible as a fitness advocate for decades. But on a more personal note, his birthday got me thinking about the amazing consistency LaLanne has represented in an industry that has often been known for lack of ethics, trendiness and inconsistency. While we take the fitness industry for granted today, and that's pretty much a new development. In the 40's, 50's and 60's, there were many "fitness" experts who made wild and crazy promises, who urged the silliest possible exercises to women in order to help them "stay desirable" and who opened high-pressure, high-cost "spas" which basically catered to people with more money than sense. Fitness centers had equipment that was either geared toward body builders, or machines with rollers and belts that would "vibrate off the fat." Athleticism among women was considered unfeminine. Healthy eating was defined as red-meat-and-potatoes, with plenty of canned vegetables topped by butter. Cross-training by athletes was virtually unknown. LaLanne was a kook in many ways. But a healthy, consistent, upbeat kook, who gave millions of housewives a better perspective on fitness. He paved the way for what actually developed into fitness as we know it today - creating a climate for Jazzercize, Jane Fonda, Denise Austin (another California fitness professional who was LaLanne's co-host for a time) - which helped build an industry that today affects every American and is a part of our daily conversation. A neighbor in her 30's heard me say it was Jack LaLanne's birthday and asked why I'd care about that man who does infomercials for juicers on late night tv. Then again, she also gave me a puzzled look when I mentioned Jane Fonda's impact on fitness. I'm immensely impressed with California Governor Arnold Schwarzenegger and his wife Maria Shriver, who made certain that LaLanne was inducted into the California Hall of Fame in 2008 so that his contributions would be recognized. Thanks again, Jack LaLanne. And Happy Birthday. Isn't this what childhood should be about? Building forts and playing in mud, enjoying the outdoors and running and playing? The Bay Area Children in Nature Collaborative thinks so. At the Emmy Awards - it's "Thanx to SPANX"
The 61st primetime Emmy awards air this Sunday, September 20, and everyone knows that award shows are as much about what the stars are wearing as who is winning what. MTV Video Music Awards - will the tribute to Michael Jackson inspire you or make you sad? The tribute to MJ that is in the opening segment of tonight's VMAs should remind us of what we loved about the music and the movement of Michael Jackson. Check out the Family Fitness Day September 26 at Almaden Valley Athletic Club from 10-3, with dozens of free classes, health assessments, fitness tips. The free event is designed to encourage a healthy lifestyle for families by offering physical activities and also includes nutritional education by Whole Foods Market. There will also be prizes, coupons and other freebies. Four tips from fitness expert Andrea Metcalf can improve your golf game. Corporate fitness programs: do they just keep the fit healthy? Or, is there true ROI? Melanie Oudin's shoes: have you caught "Believe" fever? 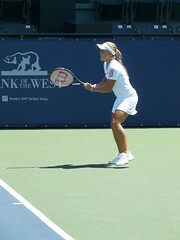 Watching 17-year-old U S Open tennis phenom, Melanie Oudin we can't believe it! Or, even better, we CAN believe it. As she said after her match with Petrova, I just started to believe I could win. And yes, those shoes that are so perfect for her - even they say "believe" on them - an idea she says her boyfriend contributed. It's happened not only in that match against Petrova, but all the way through the U. S. Open. She's turned into a powerhouse player this tournament. Ranked 70th she's been beating them all...so far at least. "They call it a Cinderella run. Don't you believe it. No fairy godmother plucked Melanie Oudin out of obscurity, and handed her a magic slipper. She worked for it, she focused, and as she has said, she believed she could do it." Jesse Witten: surprise underdog comes on strong at US Open. See what fitness will get you? The fitness events calendar for September 2009 is live on San Jose Fitness. It's not a long list like we've seen in the spring and summer months - though there are a number of events - Labor Day Run, Bike MS, etc. But it is a great month to try some alternative forms of fitness - for instance, as the weather mellows out in San Francisco and the bitter cold fog of summer disappears, it's a perfect time to head up that way for walks on the hills, or in the parks. A day in Golden Gate Park, a walking tour of one of your favorite neighborhoods, or you could even take the family out to Alcatraz. It's just a perfect time of year to get out and walk. Or forget San Francisco. Spend a day walking around Mt. Hamilton (pictured above), or go north to the wine country. And... September is National Yoga Month... honor your body by taking a yoga class. Lots of free classes around in September. So this month - try something new. Ride a bike, take a hike, or visit nearby fitness studios in search of a "home" for your winter workouts.